Reading is very important to Pat and me. We both love to read, think it is important to read to learn and for fun, and we want our kids to love to read. 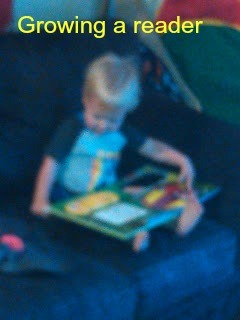 Ben loves to play with books, and I hope this love of books continues throughout his life. Here are a few ways we are actively trying to encourage Ben to be a reader. 1) We read to Ben as a baby. We’ve been reading to him since he was born. When he was little and would just need to be held and rocked, I would read aloud whatever I was reading at the time. Sure, I skipped over anything I felt a baby shouldn’t hear, but I’m not sure that was really necessary. What helped Ben was hearing my voice. Reading allowed me to find a soothing rhythm to speak to him with. It also gave me something else to focus on a little bit, which can really help at the end of a long day. I can honestly say the girls won’t get as much time listening to grown up books, but I fully plan to have them around when I read to Ben. I will also read to them. I think it is never to early to learn to enjoy a good story. 2) We read to Ben now. This seems like an easy one. Toddlers love to be read to. Ben brings us books all the time. Sometimes we sit and read them all the way through. Sometimes he gets bored and wanders off and we let him. There is no need to force him to finish a book at this age. Other times we just sit and look at the pictures. We talk about what we see and point out things like colors and shapes. We read new books and old books. Oh, I fully admit sometimes books ‘go missing’ when Pat and I just can’t take them another time. But overall we make it a point to read to Ben when he wants to read. 3) We have books out. Okay, we probably have too many books out. Our entire coffee table, top and shelf, is usually covered in Ben books. Mainly we keep out board books and the paper books we are comfortable with getting beat up. But they are always out and ready for Ben when he wants them. How can you learn to love books if you don’t have access to them? Funny though, Ben does not like it when we leave our books out. He brings them to us and we have to put them away. He’s cool with his books being out looks at them frequently throughout the day. 4) We take Ben to the library. Often we look at the books and check some out. But just as often we just play. We are so fortunate that we have a library system that really encourages bringing in small children to play. They have toys out and activities throughout the year for them to participate in. I have been taking Ben to library programs since he was 12 weeks old. Most of them have a portion where the librarians read to the children, but a big part of them is just playing. I think this helps kids grow to love the library and see it as a fun, friendly place. Ben is always thrilled when we go to the library. We participate in the reading challenges during the year too. No, I don’t think Ben cares that we read books based on the theme of the season, but it forces me to find new books for him and remember to read together. 5) Pat and I read. I am a voracious reader. I always have at least one book going, usually more than that. We have these books out where Ben can see them. (Just not mixed in with his books of course. He doesn’t like that. ;) ) We let him see us reading too. I know it might make me sound like a bad mom to read in front of my son. But really, he does not need me playing with him 24/7. He can be content and doing his thing and I can be doing mine. I’m still with him, but we don’t need to be doing the same thing. Sometimes he sits on the couch and reads his book while I read mine. I have also pulled out my book when we watch yet another showing of Frozen or Mickey. I think it is good for Ben to see his parents read. It is also good for him to see what we can be around, but don’t have to be interacting with him non stop. My reading gives him a chance to have some independent time to do his own thing while still being around and supervising him. 6) We don’t force it. Okay, we kind of do. We read and always have books out. But if Ben isn’t feeling it, we don’t force him to read. If he wants to stop in the middle of a book we let him. If he would rather put the books away and play with his toys, that’s fine. If I am reading and Ben comes over and wants my attention, I give it to him. At this age forcing Ben to read won’t do anything. My mom likes to remind me that I didn’t like to read until I was in first grade. Oh, I liked being read to. I just didn’t see the point in learning how to do it myself. Well, apparently I got over that because now reading is one of my favorite things to do. So I’m not worried about how much Ben reads now. All I can do as a parent is give plenty of opportunities and access to books. It’s up to Ben from there. I hope this helps other people in their goals to foster a love of reading in their children. Of course I am not expert. I mean, Ben is 2. But so far he enjoys his books, and I think by giving him the chance to continue that enjoyment without pressure he will be set up for a life of reading. At least I hope so! Be sure to check out the other BFBN ladies to get more tips on reading and learning. Check out the pinterest page as well!